Sometimes the messy meals are the ones that taste the best. I am talking chili, stew, gumbo or anything where you throw a mixture of delicious food into one bowl to cook. They may not look the best, but they tend to have the most flavor because all of the food is mixed into one pile of deliciousness. That is what you have here with the Cowboy Campfire Breakfast. This recipe is so simple & easy to make over the fire. 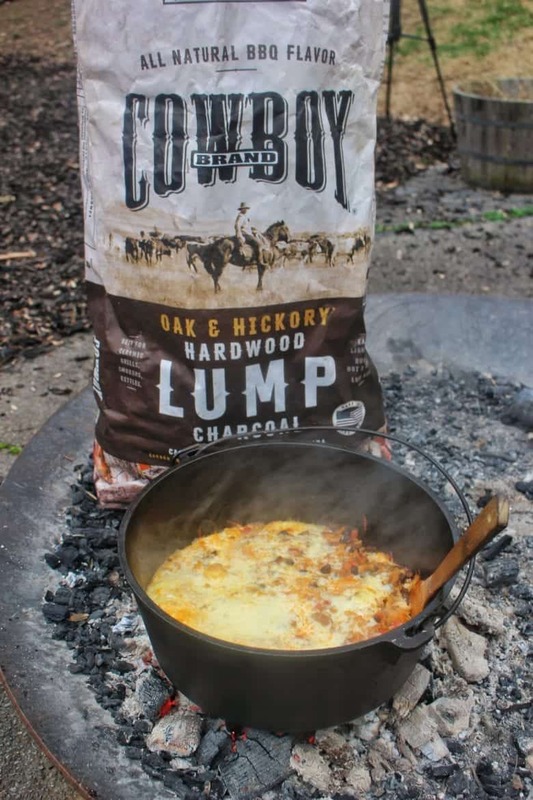 Over some hot Cowboy Charcoal, you will slowly cook all the ingredients into one dutch oven and then melt cheese on top. Add some sour cream before serving and you have a great breakfast. 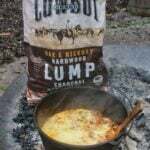 When should I make the Cowboy Campfire Breakfast? This is a hearty morning meal for those that are out camping, hiking, rving or just want a good breakfast. Best part is that you will be able to feed a ton of people with the Cowboy Campfire Breakfast! I am talking the whole family and then the people next door too! Try another classic campfire breakfast! My family used to make this when we would camp out in the woods. Nothing smells better than the scent of campfire, coffee and the Cowboy Campfire Breakfast. Now, I am warning you that it can have some spiciness. If you want more spice, then I recommend adding jalapenos! If you are looking for less spice, then swap the tomatoes with peppers to only tomatoes. Or just add more sour cream at the end. That is what I do! It will taste just the same! Either way, the Cowboy Campfire Breakfast is the ideal breakfast for the whole family! Cowboy Campfire Breakfast is a sure fire way to wake up in the morning. 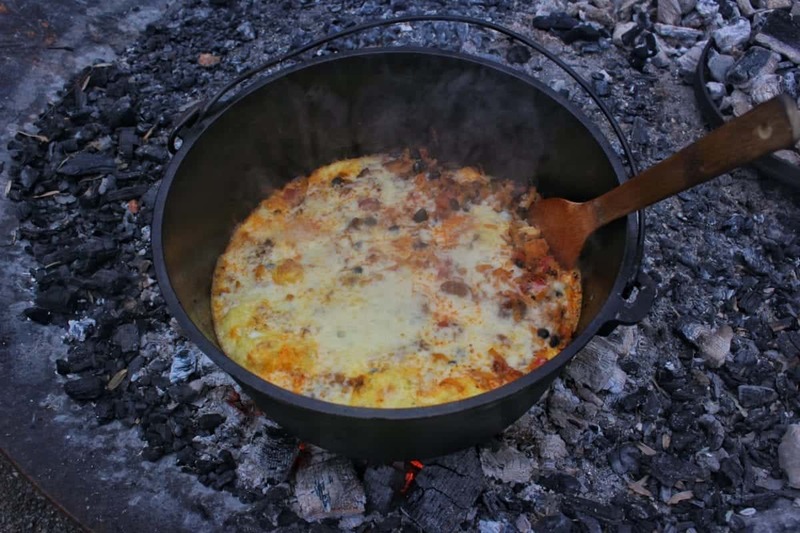 Eggs, veggies, beans and cheese melted together in one dutch oven! Place dutch oven over fire 2-3 minutes before cooking to preheat. First, add chorizo sausage and cook until browned. Next add hashbrowns and spices (Chipotle Garlic Rub if you have it!) and let cook for 5 minutes. Stir in the can of tomatoes & peppers plus the can of black beans and let cook for another 5 minutes. Finally, add the scrambled eggs on top, cover with lid, add additional Cowboy Charcoal to top of lid and let cook for 30 minutes or until the eggs are completely cooked. When done, open lid and cover with cheese. Place lid back over dutch oven, pull off charcoal and let cheese melt for 2-3 minutes. Serve & enjoy! Equipment: Cowboy Charcoal, Dutch Oven, and Tongs.